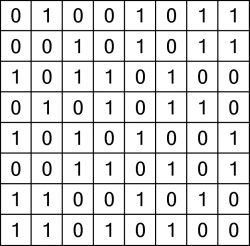 The aim of a Binary Puzzle is very straightforward: just place a 0 or 1, the two binary digits, into each empty square. 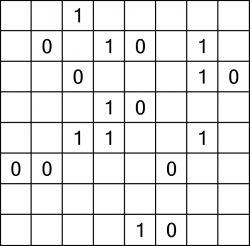 The resulting grid must obey a simple rule, which is that there are never more than two 0s or two 1s when reading across or down each row. And that's it! 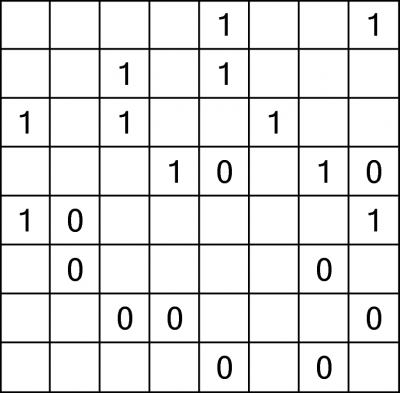 In a variant of the puzzle, an extra constraint is added whereby no two binary numbers reading across or down can be the same, but we recommend supplying the puzzle without this rule because it adds unnecessary complexity for the solver. The puzzle is arguably more interesting without this extra rule. Puzzles can be made at a range of sizes and difficulties, but ones the size of these samples tend to be the most fun.